A potential strike at CP Rail adds to industry’s rail capacity woes; while the closure of the Huron Central Railway would be particularly traumatic for EACOM. In other Business news: industry leaders in Ontario want a better natural resources strategy; and the Lesprom Network reveals who’s up (Russia) and who’s down (Canada) when it comes to softwood lumber shipments to China. In Forestry news; the Ancient Forest Alliance is working hard to generate news coverage about old growth logging on Vancouver Island; the Montreal Economic Institute raises cost concerns of protecting the caribou; the U of New Hampshire says reduced harvesting in Maine can increase carbon uptake; a Vancouver lumberjack wins a world title in France and new research finds tall Amazon forests are three-times less sensitive to drought than short forests. Finally, Chinese researchers make supercapacitors—touted as the future of batteries—from wood. Thousands of workers at Canada’s second-largest railway could walk off the job as early as Tuesday night, adding to the transport woes that have stranded commodities across the nation’s Prairies. More than 3,000 Canadian Pacific Railway Ltd. train conductors, engineers and electrical workers represented by Teamsters Canada and the International Brotherhood of Electrical Workers could walk off the job as early as 10 p.m. Eastern Daylight Time if a negotiated settlement isn’t reached, according to a Teamsters Canada statement Saturday. Teamsters members voted 98 percent to reject the company’s final offer on Friday. …The uncertainty over a possible labor disruption comes after a lack of adequate rail capacity led to piles of commodities being stuck on Canada’s Prairies this winter, including grain, oil and lumber. EACOM Timber is prepared to pull out all the stops to keep its Nairn Centre sawmill running even if rail freight service is discontinued between Sault Ste. Marie and Sudbury. Christine Leduc, director of public affairs for the Montreal-based forest products company, admitted that would be a difficult task since the mill has no other rail alternatives and trucking capacity in the northeast is very limited. …Genesee & Wyoming Canada, the parent company of the Huron Central Railway, announced May 22 that it intends to discontinue operations on the 283-kilometre line at year’s end. …Discussions with the provincial government to secure matching funds appear to have gone nowhere, though the Northern Ontario Heritage Fund recently provided the railway with $882,650 for track and crossing upgrades. Timmins Mayor Steve Black was joined by several high profile business leaders Monday to call on the new Ontario government, no matter which party wins the election, to create a formal natural resources strategy that goes above and beyond anything done before. The event was a roundtable that brought together mining, forestry and business leaders for talks at the Timmins Chamber of Commerce. …Black said the gathering was non-partisan and was not endorsing any single political party. …Kevin Edgson, president and CEO of EACOM Timber said seeking sustainability for resources was not necessarily a pro-business decision. …The importance of the forestry industry in the North was highlighted by Derek Nighbor, president and CEO of the Forest Products Association of Canada. He said the industry has developed strong global markets and continues to be innovative. TIMMINS, ON – Days before Ontarians head to the polls, representatives from Aboriginal business, mining, prospectors, forestry, local government, and the broader business community are calling for the creation of a provincial natural resource strategy with specific actions, following a roundtable discussion held today in Timmins. …”At a time when Ontario is facing a skills mismatch, our next government must take bold action, working with the natural resource and northern communities, to address current challenges and provide a pathway forward for industry leadership in the global marketplace.” said Rocco Rossi, Ontario Chamber of Commerce President and CEO. The need to develop this strategy was the primary recommendation that emerged from today’s landmark meeting, which was convened… to stimulate thinking on priorities and opportunities for growth in Ontario’s resource sector. Oregon’s senators have thrown their weight behind a bill that could change the industry in Oregon and beyond for years to come. U.S. Sens. Ron Wyden and Jeff Merkley, both Democrats, attached their names to a letter urging the Committee on Agriculture, Nutrition and Forestry to include the Timber Innovation Act, which streamlines and incentivizes the development of mass timber products, in the upcoming farm bill. Merkley said Thursday the timber bill has bipartisan support, including from Republicans in Idaho, Montana and Mississippi, and said he’s optimistic it will be included in the farm bill….Central Oregon communities like Bend and Prineville owe a lot of their early growth to the wood-product industry, but the industry has waned in recent years. SAGINAW — A massive fire on Sunday evening destroyed the Whitsell wood products manufacturing plant in Saginaw, north of Cottage Grove. The fire, which was reported at 7:36 p.m., completely engulfed the mill within 30 minutes, according to Lane Fire Authority Chief Terry Ney. Flames in the mill could be seen from a half-mile away. Billowing plumes of smoke rose into the evening sky and could be seen from Eugene, 20 miles to the north. No injuries were reported. After destroying the 169,000-square-foot mill building, the fire spread to stacks of finished lumber products on the roughly 46-acre site. Ney said that with so much fuel to feed the fire, firefighters took up a defensive posture and had resigned themselves to pouring water on the log piles through the night, into Monday and beyond. 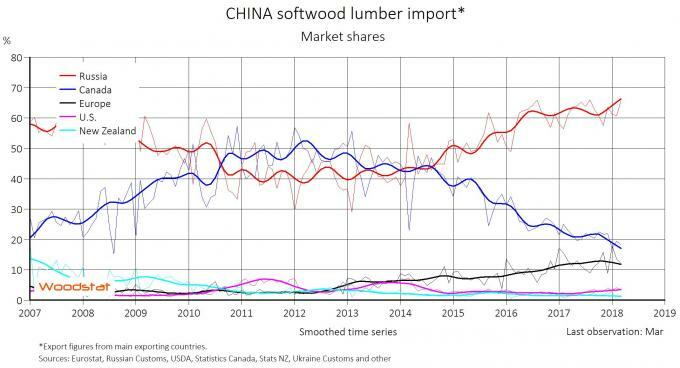 The export of softwood lumber to China from leading exporting countries amounted to approximately 2.17 million m3 in March (-6% compared to 2017), Woodstat reported. The export totaled 5.60 million m3 during January-March (-6% compared to 2017). The trend line for the export of softwood lumber to China decreases further, but remains at a very high level. Russia exported approximately 1.43 million m3 of softwood lumber to China in March (+1% compared to 2017) and Canada exported 395,000 m3 (-26%). During January-March Russia exported 3.52 million m3 of softwood lumber to China (+1%) and Canada exported 1.02 million m³ (-26%). The Russian market share in the Chinese lumber market is increasing at a record high level. The smoothed line for the Canadian market share is decreasing at a very low level for the country. …Among the European exporters, the Finnish market share in the Chinese lumber market is decreasing but remains at a high level. …While using cross-laminated timber (CLT) is a common building practice in Europe, [it] is still catching on in the United States. In Columbia Falls, SmartLam is running one of the first CLT production facilities in North America, whereas builders in Austria have been studying and using CLT for residential and commercial building for decades. The benefits include high efficiency, longevity, minimal upkeep, and using a renewable resource – wood – instead of steel. The building style also removes the need for drywall in many cases, because the CLT is not only structural, but also the inner finish of the home. The Patrick and Ron Clark (Wooden Haus Supply) … recently received a Wood Innovation Grant from the U.S. Forest Service to continue developing and studying a new method of using smaller diameter trees and lumber for CLT projects. The fungal disease “Esca” infects grapevines and causes great financial damage to winegrowers every year. The fungus infects the vine trunks and decomposes the wood from inside – so spraying cannot reach the fungus. Dr. Frederik R. Wurm and colleagues have developed a nanotechnology-based carrier to protect and heal the vine from the infestation. …The shell of these balls is made of lignin – a substance that is the main component of wood besides cellulose. Therefore, this shell can also be decomposed by the fungus, thus releasing the agent inside the nanoparticle. “It is almost like a Trojan Horse: the fungus decomposes the shell of our nanocarriers and releases the fungicide that fights it”, says Wurm. Supercapacitors are touted by many as the wave of the future when it comes to battery storage for everything from cell phones to electric cars. Unlike batteries, supercapacitors can charge and discharge much more rapidly… The key to supercap performance is electrodes with a large surface area and high conductivity that are inexpensive to manufacture, according to Science Daily. Carbon aerogels satisfy the first two requirements but have significant drawbacks. …Researchers at the University of Science and Technology of China have discovered a new process that is low cost and sustainable using nanocellulose, the primary component of wood pulp that gives strength to the cell walls of trees. Once extracted in the lab, it forms a stable, highly porous network which when oxidized forms a micro-porous hydrogel of highly oriented cellulose nano-fibrils of uniform width and length. VICTORIA – The Forest Practices Board will examine the activities of the BC Timber Sales (BCTS) program and timber sale licence holders in the Dawson Creek Timber Supply Area (TSA) portion of the Peace-Liard Business Area, during the week of June 4, 2018. Auditors will examine whether harvesting, roads, bridges, silviculture, fire protection activities and associated planning, carried out from June 1, 2016, to June 8, 2018, met the requirements of the Forest and Range Practices Act and the Wildfire Act. …This BCTS program was chosen randomly for audit from among all the BCTS programs in the province. The board normally audits two BCTS programs each year. Denay Billette is one of four female Indigenous recruits out of a class of 40 selected by their First Nations to receive training last week from the Prince Albert Grand Council on the shores of Lac la Plonge, near Beauval, Sask., to battle the province’s wildfires this season. …Under the program, First Nations and northern communities choose people from their regions to send to the front lines of Saskatchewan’s wildfire fight. It’s run in partnership with the provincial government, and participants are given seasonal contracts that will see them working to suppress and prevent fires across the province all summer long. …Billette is a second-generation firefighter from Buffalo River Dene Nation in northern Saskatchewan, about 500 kilometres north of Saskatoon. She grew up watching and smelling smoke from wildfires close by, and has stayed behind with her parents during several evacuations to protect her community. They’re the giants of the forest — massive, old-growth western red cedars and Douglas firs — and images of these towering trees being cut down have sparked outrage. “The visuals that we’re starting to see come out the latest cutting of old growth forest is really devastating,” says B.C. Green Party forestry critic Adam Olsen. “It’s important we’re protecting the old stands, especially on Vancouver Island where we have so little old growth left” Olsen says he’s shocked the B.C. NDP government is letting it happen. 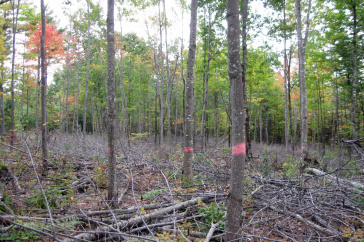 …”What we’re seeing right now is the liquidation of our forests!” says Olsen. “Frankly, this government has continued the exact same policy as the Liberal government did. …The province says it’s working on modernizing the land use plan. As it stands now, only about 55 per cent of old growth forests on crown land are protected. Andrea Inness, a forest campaigner with Ancient Forest Alliance, and several other people went on an expedition on May 6, to the Nahmint Valley, which is about an hour outside of Port Alberni on logging roads. …“We expected to see some logging, but we were all astonished to see how much had taken place. There were near record-breaking trees that we found that were being cut,” Inness said in an interview. “We were shocked at the scale of the logging and so dismayed to see these cedars lying on the ground.” Adam Olsen, the B.C. Green Party critic for forests, said this issue could become a big problem for the government, if they don’t change their policy. B.C.’s best axe man is finally a world champion, although, on the phone, lumberjack Stirlng Hart sounds more relieved than elated with his big win. “It feels a lot better than second place, I’ll tell you that,” said the 28-year-old Maple Ridge native. 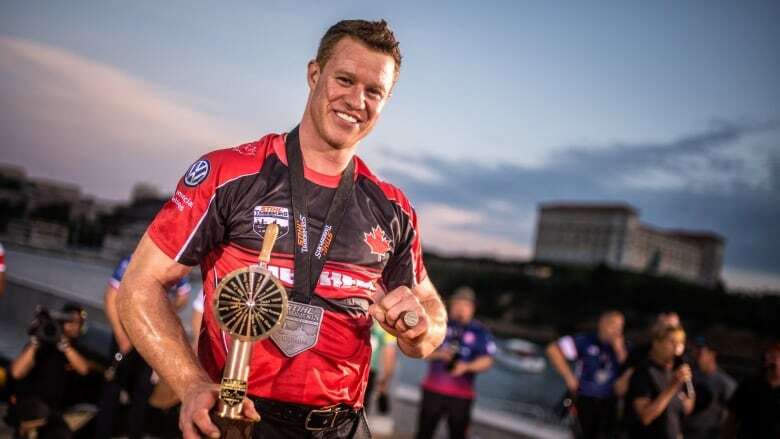 Hart out-chopped, out-sawed and out-sprinted all comers at the gruelling Stihl Timbersports Champions Trophy in Marseille, France, over the weekend, handily beating hulking New Zealander Jason Wynyard in the gold medal final. …Timbersports isn’t a sports page fixture, but Hart hopes his win will attract a little media attention in Canada. …Hart is a third generation lumberjack (his father and grandfather both competed) with a gift of the gab and an instantly identifiable 12 cm scar across his right cheek. …Last year the certified arbourist and tree faller launched Alpine Acceleration, a company that thins forests for growth and for forest fire protection. MONTREAL – Environment and Climate Change Canada recently published a report criticizing the measures taken by the provinces to protect the boreal caribou. If Ottawa decides to intervene, it must take into account the economic costs of protection measures and the realities of each province. “A strict application of federal requirements could be very harmful for the Ontario economy,” points out Alexandre Moreau, Public Policy Analyst at the MEI. “Around half of forestry activity in Ontario takes place in boreal caribou habitat, and could therefore be affected. This represents $2.6 billion of economic activity and some 18,300 direct jobs.” To comply with federal standards, the provinces and territories have to limit the level of disturbance of boreal caribou habitat caused by human activity or forest fires to less than 35%. The Quinault Indian Nation will host the 42nd annual Indian Timber Symposium from June 4-7 — an event that brings tribes and participants from across the country to the Ocean Shores Convention Center and Quinault Beach Resort & Casino. As one of the original founders of the Intertribal Timber Council (ITC) in 1976, the Quinault Nation will be hosting the symposium for the fourth time. …The timber council works with the Bureau of Indian Affairs, state and federal agencies, private industry and academia to “explore issues and identify practical strategies and initiatives to promote social, economic and ecological values while protecting and utilizing forests, soils, water and wildlife.” It also encourages the training and development of Indian foresters, with a large focus on youth education and resource sustainability. HANOVER, N.H. — Amid the buzz of a chain saw and banging hammers, a group of Dartmouth College students help cut down an ash tree and strip the bark that would eventually be used to make traditional Native baskets. Their outdoor classroom experience is part of the academic outreach and hands-on learning that has helped Dartmouth graduate more Native Americans than any other Ivy League institution. …After the tree was felled, the students took mud from a nearby stream. They placed it over the tree stump for regrowth purposes, and then helped each other carry the logs out of the woods and back to the farm. The students stripped the tree’s flaky exterior to unveil a smooth inner bark, and processed the log into strips of wood. The Institute of Foresters of Australia is calling for nominations for, His Royal Highness The Prince of Wales Sustainable Forestry Award for 2018. ‘It is about forests and foresters’, said Mr Rob de Fégely, Vice-President of the Institute of Foresters of Australia and Director responsible for international relations. ‘His Royal Highness has a well-known passion for forests and natural production systems. In recent years, he has provided support to the professional forestry institutes in Australia and New Zealand and prior to that in Canada and United Kingdom. …‘It is critically important that we continue to train professional forest managers who have the broad range of skills that early foresters were trained for to manage our forests for production or conservation purposes. …, said Mr de Fégely. 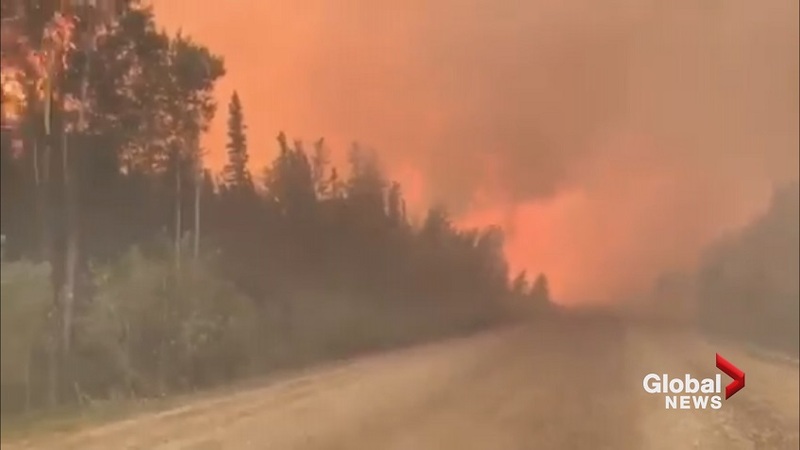 A huge wildfire burning north of Fort St. John has forced an evacuation order for some residents and a closure of crown land in the area. The Tommy Lakes wildfire is now an estimated 16,954 hectares in size after merging with the Beatton Lake wildfire on Friday. It is zero per cent contained. The Peace River Regional District issued an evacuation order for Electoral Area B on Saturday. …There are currently 90 firefighters, seven helicopters and seven pieces of heavy equipment fighting this blaze. The primary objective at this time is to establish guards around the fire and conduct controlled burning operations in order to protect oil and gas infrastructure in the region. …B.C.’s tinder-dry weather is not helping… “What has been somewhat unusual has been the fire behaviour …more of a pattern we’d be seeing later in the summer,” Kevin Skrepnek with the BC Wildfire Service said. KAMLOOPS, B.C. — Wildfire crews in British Columbia were watching the weather as a number of blazes burned Monday in several regions of the province. Environment Canada was forecasting showers and cooler temperatures by Tuesday or Wednesday for most of southern B.C., but Kevin Skrepnek of the B.C. Wildfire Service says winds that come with that cold front are a concern. …”If we can make it through the next 24 or 48 hours, it looks like the weather is going to shift to more seasonal,” Skrepnek said on Monday morning. …June is traditionally a wet month and rain could keep a damper on wildfires in July and August, he said. “What has been unusual about the fires we have had is how aggressive these fires have been,” he added. …A new study led by Pierre Gentine, associate professor of earth and environmental engineering at Columbia Engineering, shows that photosynthesis in tall Amazonian forests–forests above 30m–is three times less sensitive to precipitation variability than in shorter forests of less than 20m. Taller Amazonian forests were also found to be older, have more biomass and deeper rooting systems that enable them to access deeper soil moisture, which makes them more resilient to drought. The paper was published online May 28 on Nature Geoscience. “Our findings suggest that forest height and age are an important regulator of photosynthesis in response to droughts,” says Gentine …Climate change is altering the dynamics, structure, and function of the Amazon. While climate factors that control the spatial and temporal variations in forests’ photosynthesis have been well studied, the influence of forest height and age… has rarely been considered. More than $1bn of public money being spent on cutting greenhouse gas emissions by planting trees and restoring habitat under the Coalition’s Direct Action climate policy will have effectively been wiped out by little more than two years of forest-clearing elsewhere in the country, official government data suggests. The $2.55bn emissions reduction fund pays landowners and companies to avoid emissions or store carbon dioxide using a reverse auction – the cheapest credible bids win. The government says it has signed contracts to prevent 124m tonnes of emissions … An analysis by the Wilderness Society suggests the official figures underestimate the rate of land-clearing, and in reality the projects paid for from the Direct Action emissions reductions fund would have had their work nullified in even less time. 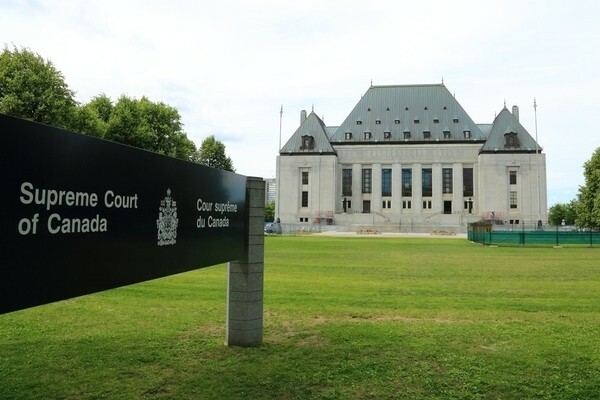 The Supreme Court of Canada has upheld the decision of the Court of Appeal for British Columbia, which found a forestry company liable for the death of a contract worker employed on its premises. In West Fraser Mills Ltd. v. Workers’ Compensation Appeal Tribunal et al., the Supreme Court upheld a claim of workers’ compensation against a non-employer, West Fraser Mills, which as the license holder of the area of the forest where the accident occurred was the “owner” of the workplace as defined in Part 3 of B.C.’s Workers Compensation Act. A tree faller died after being struck by a rotting tree while working within the area of a forest licence held by the appellant.